2019 will be the 9th year Wargaming Tradecraft has existed. For some reason, it seems longer than that. My painting journey certainly has been going on for much longer. I want to inspire others, that's a goal of this website - and with that I'm going to take some time today to highlight some of my previous art, personal milestones and attempts to approach this hobby with an unique eye. I'm also going to share some of my personal struggles while traveling this path in hopes to help other creators who might be struggling with their own art. If there's one thing I seem to have a pattern of, it's painting for myself. Exaggeration is a common style for me, using brighter colours and stronger contrasts. I haven't always been totally OK with feedback I've received in the past, but much of those struggles was when I was younger and before I'd accepted that my style is going to be something I had to become comfortable with. It's always difficult to have people disagree with something you've spent a lot of effort on and put a lot of love in to. Try to see the useful advice, while still being true to yourself. Take from this article what you can. Links to the projects and tutorials if you want to see them in detail. There's some insight into my process and history. I've also shared some of my thoughts and feelings as I can recall them at that point in time. If you'd like to see more of what I've done, read through my Projects page and DeviantArt. If you feel you've gotten something from reading my site for the first time or as a returning reader, all I can ask of you is please leave a comment here or on Facebook if something moves you or consider making a donation through PayPal. 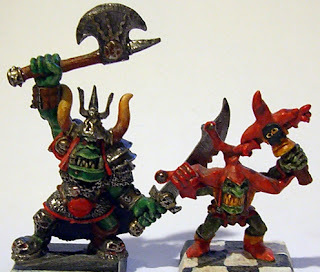 The mini to the left is a Games Workshop Skaven and is one of the first I painted in the mid 90s when I was 13. A big thanks goes out to my parents for investing in that first box of Heroes Quest miniatures and being supportive of my younger self when he was curious about trying a new hobby. Who knew that things would spiral so far out of control and lead to something that's still such a strong passion as an adult? :) It's always interesting to see how people take to the hobby after trying it briefly at events like the Paint and Takes I host at Maker Expo. Parents - encourage your children when they want to try a new hobby. At this point, all I'm trying to do is replicate some of the images and rough tutorials in gaming books. (Keep in mind, this is before Internet had gaming resources.) I'm not exploring the art or trying to be amazing... I'm just painting miniatures. Around this time I picked up a box of roughly 100 used Ral Partha and other lead minis, for $10 at the local gaming staple, The Gamers Guild. Ah, armour and chainmail. I discovered I _loved_ chainmail. Paint it black, dry brush silver. Boom. This was the first technique I learned that I felt proud of. I painted everything I could that had chainmail. When you find something you feel good about - embrace it. Take the Win. What am I playing during these years? Mostly Epic-scale Eldar in the games of Space Marine, Epic 40,000 and Titan Legions as well as some Warhammer Quest and Space Hulk. I chose Eldar because they looked the most "sci-fi" and I liked their sleek style. 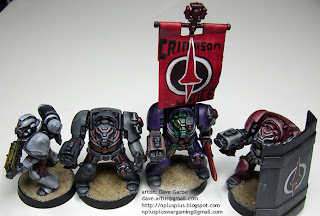 The natural progression brought me in to the full scale of Warhammer 40k and battles became larger with friends that I introduced to the horrors of the 41st millennia. 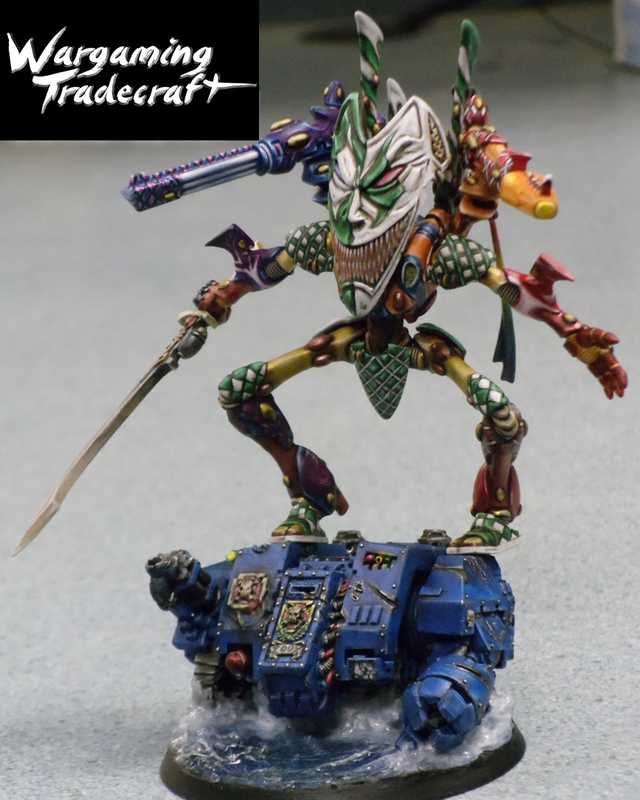 Photos of most of my Eldar can be found in my DeviantArt gallery. 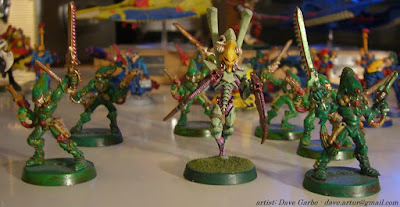 My first foray into Eldar was much like my attempts at Fantasy. 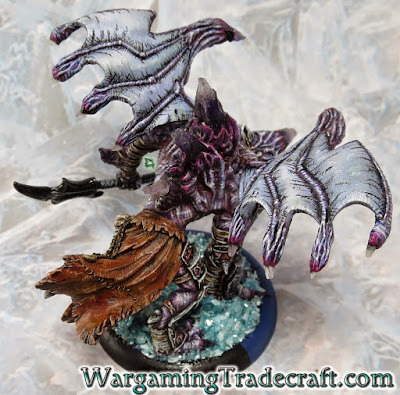 I was just trying to paint some miniatures and replicate the images I was seeing in rulebooks. This is what I came up with. 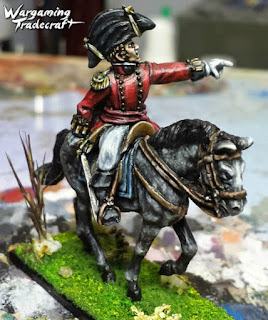 I also had a weird revelation at some point that washing miniatures with a certain leather-brown made it look like sunset. 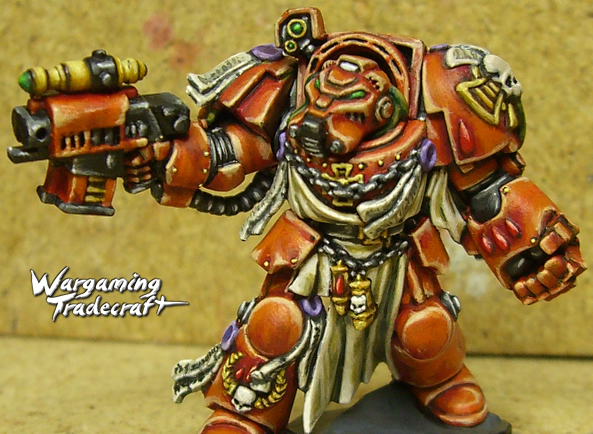 My child-self really liked this and went nuts for a while washing and re-washing old miniatures to give them the look. I'm not a fan of the look in retrospect, but it was an early attempt by me where I discovered a style I liked and committed to it. It was also an attempt to bring a uniform appearance to an army that felt visually disjointed. I love the Eldar look, but I'm not sure what a fan I am of even unit being painted SO different. This taught me another lesson - never repaint miniatures. I was kind of disappointed in what I'd done because I lost the history of the models I'd already painted and washed again. When you paint a miniature, it represents where you were at that point in your past. I took some time off here and there, especially in my later high school years. I wasn't playing anymore, but I returned to painting mayyybe around college? During this time, I fell into my first real style that paved the way for the rest of my Eldar. I was still young, but proud of the fact I was maintaining clean lines, painted details and strong shadows. All the while, I was avoiding anything that could lead down the path to grimdark. I wanted miniatures that were bright, that would stand out, that embodied the science fiction of the Eldar. For one, because they're alien, they're Eldar.. for another because I hated the look of a blob of darkness that SO many other armies created at the time. Yes, strong shadows. As I looked around, outside and well lit places, I was seeing strong shadow and not noticing much of the subtleties that light can play. This strongly influenced what I was painting and I ended up with a style that eventually received the compliment, "cartoony." This was the first criticism I really struggled with. Nobody was saying they looked bad, but I wasn't aiming for cartoony and didn't see it until it was pointed out to me. Then, all I could see was this cartoon sci-fi army that I'd spent an uncountable amount of time building. It hurt and it shook my confidence for a long while, until I eventually embraced this as a "style" for my Eldar and got pretty good at replicating it. This crisis and introspection was what led me to start understanding what it was I wanted to get out of the hobby. Figure out the style I was after. Own it. Enjoy it. Feedback can hurt, but it's also a way to grow. The first miniature I painted in detail for a tutorial was an Eldar Guardian. It's still very much in with my Eldar style and not great quality, but I think it laid out some basic processes fairly well. I also dabbled with painting some marines up like the Crimson Lance from Borderlands. It was a quick project, very low quality because it was just something I wanted to try. You'll see later I'll take that genre to the next level in a few years. This might also be my first attempt at converting. Again, very basic, but everyone has to start somewhere. 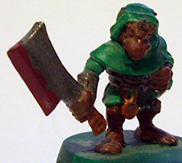 Another miniature I broke into a full tutorial was my "Dungeoneer". Basically a generic looking hero for use with Dungeons and Dragons. It's the first Privateer Press model I painted, before I actually played their systems. I like how I brought the fantasy look out in him and I'm very proud of how the face turned out. Not having done many faces, small accomplishments like this are a real ego boost. They're those things that kind of happen out of nowhere you can look back on and be proud of. I created a group of heroes for a DnD campaign which was my first attempt at more blending and detail. I'm really happy with my halfling Paladin, the greys on the Cleric were tricky but I like the blend I pulled off and the Wizard... well, I'll just say the request I got from the player was that it should have the Joker's colour scheme. As you can see, I'm also playing with layering some water effects. This has lead to expanding my collection of gels and it's upped my effects game for sure. 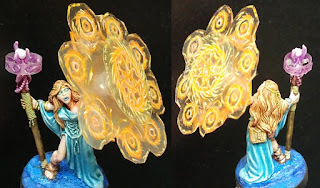 It also strongly highlighted how the base of a miniature is just as important as the figure itself. I took an amazing vacation down to Baltimore and some of the surrounding area, taking a few days to take part in Games Day. I entered two models, neither of which won, but both ended up on display as part of the Final Cut. This was another time that I had to deal with criticism through judging. I get my style isn't at all typical of what they're used to seeing, but I poured my heart and soul into these. The competition was stiff and some amazing stuff won - it was awesome to see them up close too. 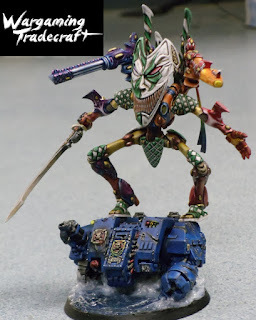 Part of what shook me was overhearing one of the people that won instead of my Wraithlord laughing about how he threw it together the night before but had chosen a newly released Forgeworld mini specifically for the contest and extra favour... So that did kind of sting and demotivated me for a while. I wish I could offer better advice from this situation, but I actually stepped away from the hobby for a while.. partially from that and partially from the intense painting leading up to the competition. It took getting back into gaming, though with Warmachine/Hordes to rekindle my love of painting. This is one of the things I often recommend to people who lose their will to paint. Game. Get those minis on the table and sling some dice! After moving to a new city I began to hang out and chat at the FLGS. 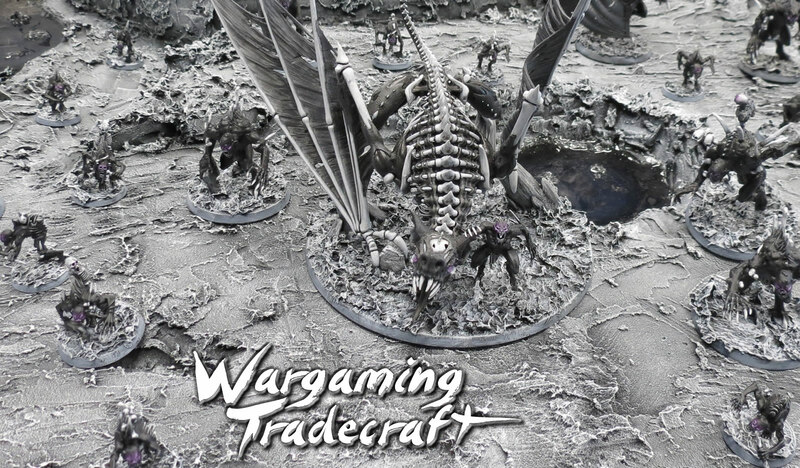 GW was out, but Warmachine and Hordes were the scene. I'd always told myself that if I ever started a new army, it would be my show-army. I needed inspiration though and so I didn't dive in right away. While watching people play and getting to know the guys, it eventually came to me. 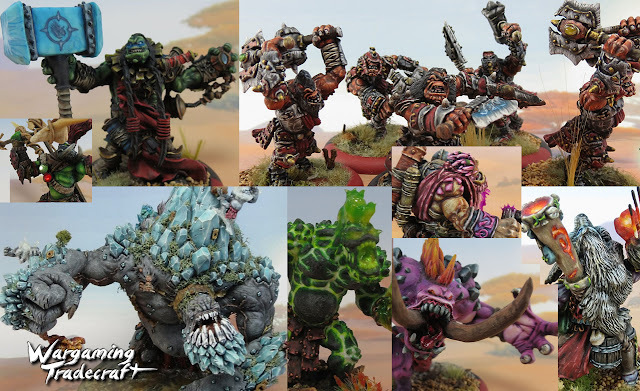 The army of Trollbloods looked quite similar to The Horde, from Warcraft. Ideas came together pretty quickly and I began building my army. I actively tried to build a style that fit the Warcraft aesthetic while adding my own flare; Soft skin and blends mixed with aggressive highlights and strong contrasts. I've pushed myself so far while working on my Hordebloods project and used so many new supplies. Carved stone, shark teeth, turtle scutes, special effects, airbrushing, metallics, lighting, moss... The list goes on and I've written about it all. This continues to be my primary focus among all the other projects I have going on or that I'm painting for fun. I'm feeling a little burned out of them at the moment though as I'm working on a unit of 14 guys. Large groups really are what crush the spirit when painting miniatures but there's nothing like getting back out there and playing to remind you why you paint. I can be tricky to rekindle your spirit and avoid burnout, but I've also written about that before. This project has caught the eye of a few people in the Blizzard realm and I was also interviewed by WoW Insider. (Now Engadget) That kind of stuff and feedback really makes projects super exciting. 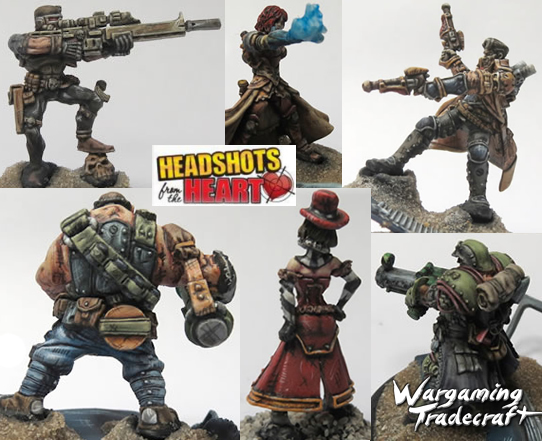 Some friends and I put together an event we called "Headshots from the Heart" back in 2012. It was a 24-hour Borderlands-themed gaming marathon. We ended up holding it for 3 years, raising a total of $11,000 for Child's Play. 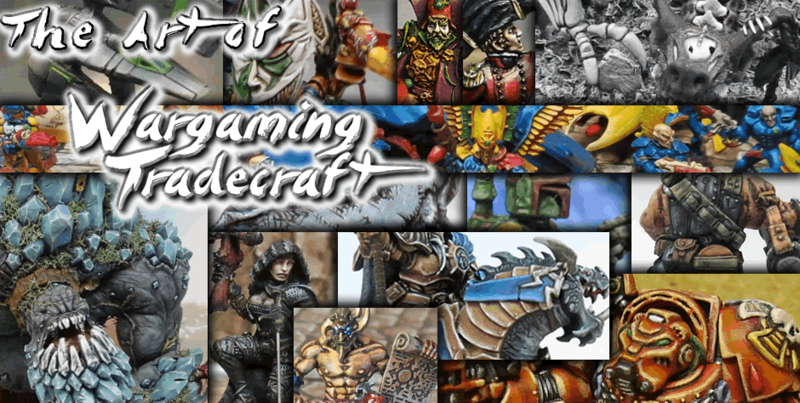 MiniWarGaming sponsored me the first year so I could auction off some miniatures. I painted each of the characters in the cell-shaded cartoon style from the games, mixing soft blending, dark borders and lots of shadow and highlight hatching. A few of these are still some of my favorite figures - the style really speaks to me. When you challenge yourself, everything might not look how you intended, but you'll probably still be impressed with what you end up creating. Over the years, I've given a number of people advice on how I painted this cartoon style. I'm kind of proud of the fact that as this method of painting has gained a lot of attention this past year or so, I might be one of the early miniature artists to explore it. My ex used to play Hordes from time to time and she asked that I use the cell-shaded style of Borderlands, applied to Legion of Everblight and the additional request that all spikes be replaced with Amethyst. I only have Thagrosh complete and while I absolutely looove how he turned out, won't be exploring this army further. Roughly 6 years after the first adventuring party that I painted up, came the next group. The Ogryn Chef, the Gunslinger Paladin, the Orphan Rogue, Pariah Cleric and my own character, the Wizard of Questionable Morals. What a group. I painted these miniatures based on their character descriptions and gave them to their players. I wasn't really trying for a specific style, though I lowered the contrast in comparison to my Hordebloods, aiming for something still very "high fantasy" while also more realistic. I'm really happy with the composition here. I feel like the group speaks well to where my skills were at at the time. Not going full out on them, but painting a head above tabletop for sure. For Armies on Parade (2016) I painted up something I'd wanted to try for quite some time - greyscale on a larger scale. There's lots of airbrushing going on here and a splash of purple on the eyes to add a touch of colour. What was so rewarding after this project, was to take a look at the board as a whole and see this beautiful overall image. Something I want to highlight here is the purple eyes weren't supposed to happen. Originally this was going to be a greyscale project only, but I'm a lover of contrast. Be ready to allow your vision to shift. As this project came together, I decided that just the black and white wasn't enough. Also, as long as I'm labeling art styles, I think it's more accurate to say that this project is black and white rather than greyscale. My love of contrast came through again and the extremes created a bold army instead of soft grey midtones. More Sin City than black and white movie. The other really fun thing about this project that I'd never done before was to write up a story for the army. A friend asked who my Scum and Villainy were, what they did? The gears in my mind started turning and a narrative came together. Click the link above to read it because I really quite enjoyed expanding my little corner of the Star Wars universe. 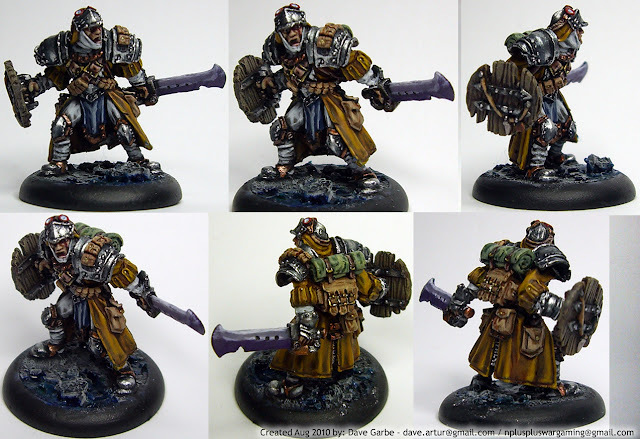 I paint one-offs from time to time as an opportunity to break from the tedium of massive projects like my Hordebloods. They also allow me to explore painting in other styles from my usual and I take great pleasure in trying these out. A contest hosted by Massive Voodoo acted as an early opportunity to do some airbrushing. 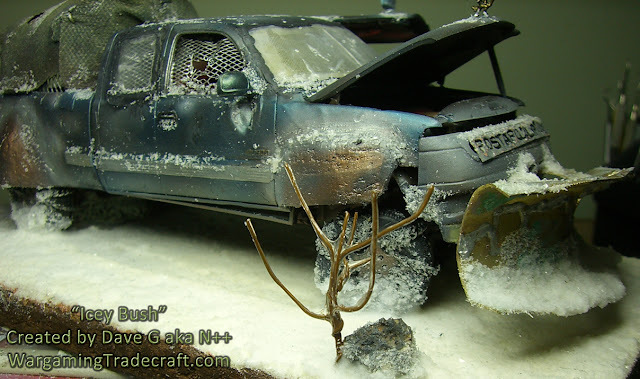 The build was a blast as well, creating a postapocalyptic vehicle, which I call the Postapocalyptibuggy. The modifying was fun, though not my usual thing so it was a good challenge. It's been ages since I built a model, which was also fun to rekindle those skills. Another year of Headshots from the Heart had me auctioning off some commission painting, which led to painting a historical figure. My aim here was to nail the style you see in an oil painting. That meant smooth blends with a bit of a gloss with less obvious brush strokes. This is another time I feel like I really brought my A-game out and managed to paint something I could really be proud of. This Age of Sigmar Knight was a little something I painted for the manager of the local Warhammer store when it first opened and he moved to town. It's great to see it out on the board and catching the eye of the next generation of gamers. Rather than accenting with dark shadows, the style I approached here was to use bright highlights. Some real obvious edge highlighting and mixing NMM with TMM. Unfortunately as the store changed hands, it disappeared. It would have been nice to have this back in my collection if they weren't using it anymore. 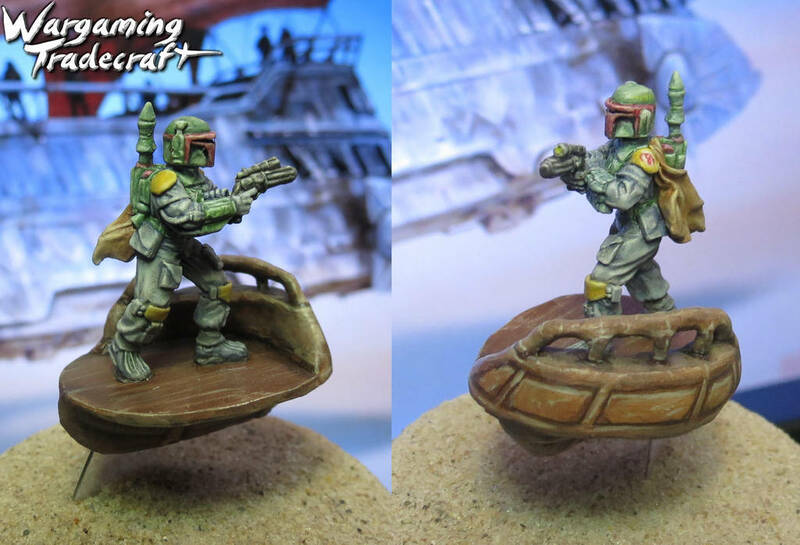 I painted up Boba Fett for an old miniature challenge. And who doesn't like the Fett, amirite? I stuck with softer colours, lighter blends and again it proved a nice challenge to try something new out. 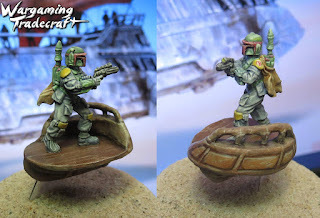 I'm not super happy with the custom skiff I made, but I do like how I made it float. Speaking of special effects.. I've got a lot of unique tutorials on my Techniques page. The movie Doctor Strange created some inspiration for me and while she didn't turn out quite how I would like, I definitely have better ideas if I tried to create these kinds of magic effects again. Though I am very happy with how they turned out for this crystal blade. Make mistakes. Seriously, don't be afraid to. Don't just "Don't be afraid to make mistakes" - actually make them. A band of Mordheim Pitfighters became an opportunity for me to attempt something darker. Grimdarkier. There are aspects of this warband I like. A lot of the skin, the carapace armour.. but I don't feel like they represent me. I dunno, they feel kind of dirty. Who knows... right now I'm doing what feels healthy for me, which means hobbying or not and when I do, focusing on enjoying it rather than writing. I did get a few articles written over the holidays, which did feel good. They're scheduled to post over the next month, so there's that to look forward to. As always, more of my day to day stuff is being posted on Facebook.